It happened earlier than I expected, but I found my fall nail colour. 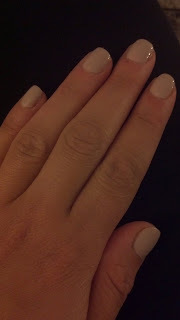 Sand Tropez is technically part of Essie's spring collection, but I think it's the perfect fall shade. I was planning to go back to a deep purple or grey this season, but I decided to get out of my nail comfort zone. I like how Sand Tropez enhances my tan (well, what's left of it), but the neutral zone will also work against my soon-to-be-pale skin colour. Have you picked your fall shade yet?